RACIST CRIME IS RIFE ON THE STREETS OF MANCHESTER - This is what Cllr Richard Leese told the Stephen Lawrence inquiry on Tuesday. Stephen Lawrence, a black teenager, was murdered by a group of white youths in Eltham, south East London. No-one was convicted of the killing and the case has aroused a huge amount of publicity and controversy, with accusations of racism in the police and in society. The inquiry has gone "on tour" to other cities, including Manchester. And on Wednesday I heard Greater Manchester Police Chief Constable David Wilmot saying on tv that just as there is institutionalised racism in society, so there is institutionalised racism in Greater Manchester Police. The "INSTITUTIONALISED RACISM IN GMP" headline fuelled further controversy - some people praised his comments, others felt he was being unfair. A few asked what exactly is meant by "institutionalised racism". "I cannot deny that there is a racial element in this and there will have been times when officers, though instructed otherwise, have been influenced by stereotypical views. There is, on occasion, an antagonism between Afro-Caribbean men and some police officers which goes both ways. Social and economic conditions can influence young people into being sucked into criminality. People from ethnic minorities are not treated equally by society and are amongst the disadvantaged in terms of education and job opportunities. Consequently it is not so surprising that they come into conflict with the criminal justice system and are over-represented in our stop-searches"
An MEN reader poll in Thursday's paper indicated that 75% of respondents thought David Wilmot was "not to be praised" for saying there was racism in the force. I'm not sure whether media whirlpool of accusation and counter-accusation helps or hinders the cause of harmony between people of different origins. For centuries Manchester has welcomed people from other parts of the world- Among the earliest documented migrants were the Flemish weavers of the fifteenth century, later arrivals included Irish, Germans, Jewish, Polish, Ukrainian, Afro-Caribbean, Pakistani, Indian (sorry for all others I've missed out), and nowadays increasingly Americans and even a Liverpudlian or two - Manchester owes its past, present and future economic success to being an "immigrant country in miniature", a sort of new world in the middle of the old. So it's unfortunate that as the new millennium is about to dawn, we're still encumbered by a problem caused, I think by a small minority, but which dominates the minds of nearly everybody. SECURITY CAMERAS ARE BEING USED MORE AND MORE IN THE FIGHT AGAINST CRIME, and a new CCTV control centre has just opened in the heart of Manchester. Cameras survey prime city centre locations - soon there will be 100 of them. 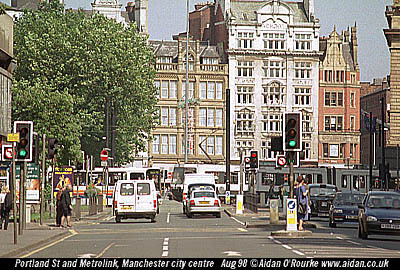 The centre is based in the Greater Manchester Passenger Transport Executive's building in Portland Street. I've heard talk of using some of Manchester's surveillance cameras as webcam's - so perhaps Internet users in New Zealand or the Yukon might be able to spot a pickpocket on Portland Street. Currently the only webcam I know of is the Pool Cam, run by the MiiD. I'd love to see a St Peters Square webcam, anyone want to set one up? SOME READERS MAY BE OLD ENOUGH TO REMEMBER THE "LAUGHING POLICEMAN", but there aren't too many of those around these days, it seems. And as featured in article by Adam Moss in Wednesday's MEN the German psychotherapist Michael Titze has come to the conclusion that people laughed three times as much in the fifties as they do today. Laughing is good for you, it' a medical fact. Ann Snowdon is working on a project at Manchester Metropolitan University entitled "Humour and Health" - laughing, she says is a health-giving physical exercise - not that the newspapers give us much cause for mirth - there aren't even any cartoons, like the "Pocket Smile" that used to appear in the MEN - jokes about mother-in-laws and women drivers are just too politically sensitive nowadays. TV humour is still going strong though, and this week, the locally set "Royle Family" finished its run of four programmes. More about them at www.phenomena.ndirect.co.uk/roylefamily/front.htm. THE MANCHESTER CONVOY HELPS BRING AID TO BOSNIA (ahh, that's better) Three MEN workers have driven to Bosnia in a yellow MEN lorry to help the sick and homeless people in Bosnia. It was part of a convoy of six trucks which sef off from the Ladywell Hospital in Salford, loaded with food and medical supplies. 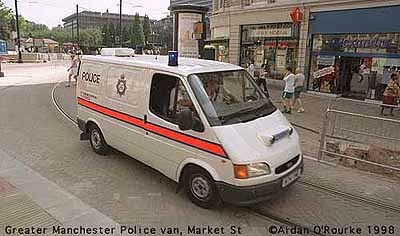 The "Manchester Convoy" may soon receive charity status and go on aid trips to Albania or Banja Luka. REFUGEES COME TO MANCHESTER - Four young people were discovered in the back of a lorry at Knutsford services on the M6 last Friday. None of them could speak English, but were heard to utter the word "Kosovo". They were taken to Wilmslow police station, then to Manchester Airport where they were interviewed by immigration officials. NELLIE GILL, MANCHESTER'S MOST CELEBRATED "FLOWER GIRL" was given a rousing send-off on Wednesday following her death at a nursing home in Harpurhey at the age of 92. She first started selling flowers in the centre of Manchester at the age of fourteen. She was a familiar face at Smithfield Market and later on "Barrow parade", the area in front of the Church Street multi-storey car park where market traders ply their wares these days. I'm sure I came across her name in my reports from Manchester fifty years ago, when the Corporation banned traders from certain streets. Nellie made soup for homeless people and used to be a regular at Bernard Manning's Embassy Club in Harpurhey. OLDHAM CELEBRATES ITS 150th ANNIVERSARY NEXT YEAR, and but festivities have already started - in London - and Dukinfield is 100 years old - the anniversary marks the conferring of municipal status - both towns have histories stretching back many centuries before that. 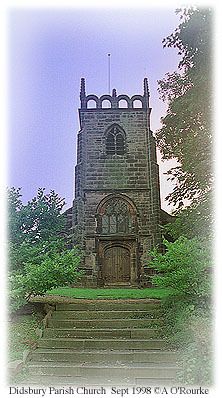 In 1974, Oldham became a metropolitan borough, and Dukinfield, formerly Cheshire, became part of Tameside. And in which year did Salford become a city? Answer below. THE LAST OF HULME'S DECK-ACCESS FLATS went under the hammer on Saturday - the bulldozer's hammer. At the controls was grandmother Val Verdy, 80, who has lived in Hulme for many years. 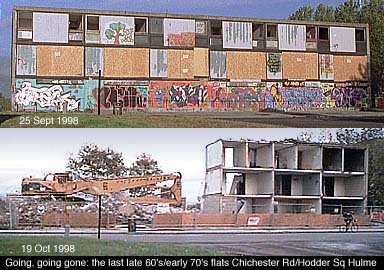 When the building is finally demolished, homes and offices may be built on the site. Nowadays Hulme has some of the best housing anywhere, with designs mixing traditional brick materials and contemporary styles. Have a look at picture number 400 (Click & hold or use right mouse button to return to this page). I've been looking at a superb book of photographs by Shirley Baker, entitled "Street Photographs Manchester and Salford". Taken mostly in the 60's, the book pictures the children and pensioners of inner-city Manchester and Salford, and the slums they lived in, which were being demolished at the time. It's published by Bloodaxe Books (1989) but is out of print. WHAT DO YOU LIKE TO TALK ABOUT WHEN YOU GO TO THE PUB? Which is better, Coronation Street or Eastenders? Is David Beckham Public Enemy No 1 after his behaviour at the World Cup? Is Ginger ex-Spice Geri Halliwell an appropriate ambassador for the United Nations? Well north west radio operator EMAP is conducting a survey to find out what people in Manchester and other north west locations think about such burning issues as the one in the poster above. The campaign is centred on EMAP stations Key 103fm, and others in Preston, Liverpool and Leeds. The campaign is handled by London-based agency Mother. And Manchester station Galaxy 102 has an ad campaign featuring a funky monkey with spinning plates - they're offering at least half an hour of non-stop dance music every hour. Century 105 FM has been fully operational now for several weeks, and their ads are still visible on Manchester bus shelters - Radio is big business. Piccadilly Radio - forerunner of Key 103 - started in 1974: I remember it well - and one of its original presenters Phil Wood (remember those giant size portrait shots on the end of the Piccadilly Plaza?) is launching a new Sunday morning show on BBC local station GMR (Greater Manchester Radio), successor to Radio Manchester (I remember that starting too!). Radio personality James H Reeve recently resigned from GMR after being accused of racism - he's starting new job with Century 105. Radio stations you can pick up in Manchester include BBC Radio's 1, 2, 3, 4 and 5, Classic FM, Virgin 1215, Atlantic 252, Talk Radio, Rock FM, Signal Cheshire, Red Rose Jazz FM, Wish FM. Exclusively Manchester area stations are: BBC GMR, Piccadilly 1152 (mw) Key 103 (fm) and Galaxy 102. Century 105 broadcasts from Salford Quays to the north west. Certain other stations also have a North West input. And a funny thing happened to me recently while driving on the M6 in Cumbria - I kept picking up FM stations from south Germany - weird! You can listen to radio via the Internet, of course, but the Piccadilly Key103 website www.key103fm.com is currently "closed for refurbishment". A GRAFFITI ARTIST FROM HULME has been chosen by the London-based BBC soap opera "EastEnders" to do artwork which will appear on-screen during December and January. A new character is to be introduced - Jamie Mitchell, graffiti-mad cousin of Grant and Phil. Tony Brady has done over 400 murals in and around Manchester, and is very pleased to have been chosen from hundreds of graffiti artists all over the country. 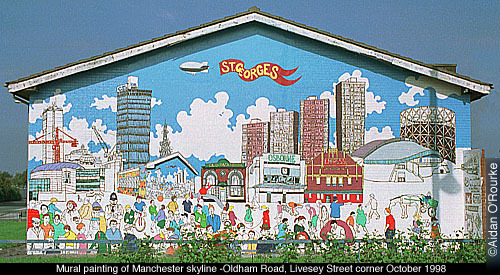 Here's an interesting piece of mural painting on Oldham Road, not far from Great Ancoats Street - , as far as I know, not painted by Tony Brady - anyone know who? - the subject matter attracted me - it's Manchester - can you see the "mural within a mural"? ARE THE CIVIC SOCIETY JUST A BUNCH OF MIDDLE-CLASS.... "trendies", standing in the way of progress, hindering the economic development of Manchester? Is the Trafford Centre "A Big Mistake?" Would you like to see the area from Piccadilly to Castlefield a totally traffic free zone? Can you name the pub next to Victoria Station that was demolished to make way for an underground railway that was never built? Which are the oldest pubs in Manchester and when did they open their doors? For the answer to these and many other questions, please go to the CIVIC SOCIETY website and click on Forum 11. 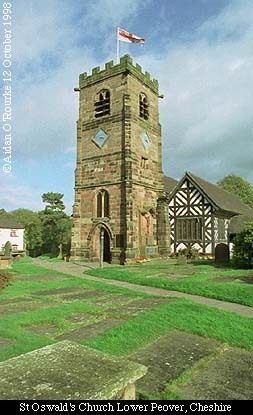 I've placed 30 new photographs online, including a night shot of the Town Hall (Click & hold or use your right mouse button to come back when viewing a JPEG pic in frames) Others I'm pleased with are Cheadle Village and Didsbury Parish Church. 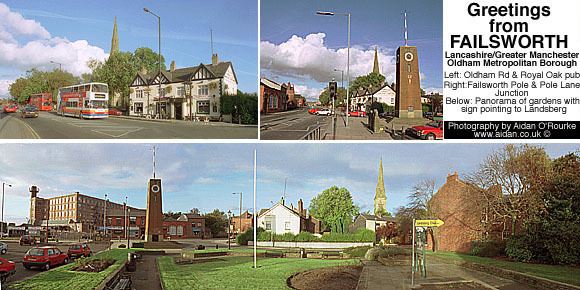 Reader-requested images include Lower Peover, Werneth Low and the ex-billiards hall, Stretford Rd. The image count has reached the magic figure of 555, and the hit counter for this page has topped 20,000 Thanks! The weather has been changeable - cloudy during the middle of last week, with rain, the the threat of gales over the weekend, and a sunny and pleasant Sunday. Last night was cold, but the northerly winds have changed to southerly, bringing warmer, but more unsettled weather. The current EWM temperature outide is a chilly 46/8 degrees. Get well soon Aidan, I've already applied for "de-toc" due to being deprived of my "3M's: Magical Manc. Medicine". I'm on the mend, thanks, and messages like are yours are always welcome! I read the article in Atlantic Monthly and thought the author painted a very poor picture of Manchester. I felt it was very one sided. There is much more to Manchester than the club scene and the problems that sometimes stem from it, as can happen in any city. Also I would have liked to have seen you given credit for the superb pictures you supplied. I agree with you, but some people have said that the article was well-written, and pointed out that you can't deny that these problems exist in Manchester. I was given credit at the bottom of the page, and the website has a link to my home page. This was a great article, Eric I presume is from The US? If so the piece was well researched especially describing the history of the city its rise and fall industrially and so on . Great effort on Eric's part describing the music scene. I left Manchester when unemployment was high in the early eighties. So a lot of what I read was news to me. Though he goes on at length about the drugs, I think that the majority of people don't do drugs, like you I grew up in the seventies disco era When the most famous club was in Wigan. Yes people did drugs but it was not prevalant. Anyway I've emailed the article to several people so that they may better understand where I am from and subsequently get a better understanding about me. And about the part of Manchester Men being more virile? It's True. I still think the picture he painted was too bleak!